(from left) Rev. Ambrose Carroll, Jo Ann Anderson, Yolanda Park, and Rabbi Oren Postrel In Sacramento Capitol Aug 22, 2017. The recognition of present and future dangers is a true catalyst for action. CIPL and the California faith community have understood this for years and it is based on the increasing danger to health and our planet that we act. As the climate crisis takes on a greater sense of urgency, people of faith are lowering pollution emissions, educating communities and advocating for strong and binding climate policy that will protect our future. 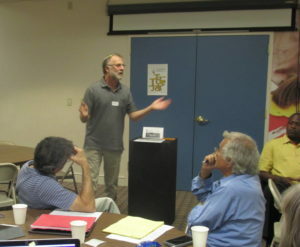 Rabbi Marv Goodman leads a discussion at the August Sacramento Lobby Day prep session. Asked for individual interpretations of this phrase from attendees, the following thoughts came forward: ‘even though a system may be unsteady, we are called to keep building’; ‘in the ultimate vision or goal for a livable planet, we all have a piece to construct’; ‘real living is in the struggle – we don’t have a choice not to participate.’ A word of caution also arose – to not feel so overwhelmed by a situation that one feels that they can’t do anything. There is always the opportunity for inclusion, for true efforts and for change no matter the circumstance. Through these valuable statements and further reflection, the group came to a common agreement that, for true change to take place, we must work on changing ourselves. As one participant put it, “I’m changing the world because I’m changing myself.” Indeed, when others see that external action for change is reflected in the person himself or herself, there is greater credibility to inspire others. Many major faith traditions understand this principle, which is the basis for true and right relationships with ourselves, others, and our planet. (from left) Allis Druffel, Rabbi Jonathan Klein, Rabbi Oren Postrel, Assemblymember Quirk-Silva, Yolanda Park, and Rev. 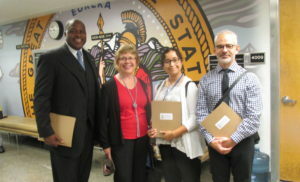 Ambrose Carroll at August Sacramento Lobby Day. 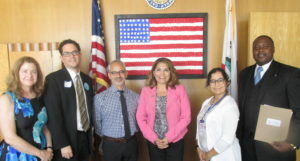 Armed with a renewed sense of purpose, communal strength, and the latest information about legislators and bills, faith advocates attended 39 meetings, focused on garnering legislative support for our priority legislation: SB 100, which would have 100% of electrical energy be from renewable sources by 2045; SB 49, which would have California continue to abide by existing federal environmental and worker safety guidelines, despite new policies from the current Administration; AB 17, which expands free public transit passes to students; AB 179, which would mandate that at least one of the nine members of the California Transportation Commission have direct experience with disadvantage communities; and AB 1082 and AB 1083, which aims to expand EV Charging Stations and infrastructure in public lands and at schools. Of this legislation, all but SB 100 passed both houses and AB 17 was vetoed by Governor Brown. In an unexpected turn of events, (though not uncommon for the last two weeks of the legislative session), opposition arose to SB 100. Despite a great deal of support for the bill which would greatly expand California’s renewable energy, create jobs, clean the air and fight climate change, the IBEW Local 1245 came out against it mainly with concerns about job protection for union workers. As we enter 2018, opportunities for crucial action abound on the local, state and national levels. In the Golden State, efforts to pass SB 100, now a two-year bill, will continue. On a local level, CIPL and affiliates are involved in a number of issues. One notable effort is in Los Angeles, spear-headed by STAND-LA (Standing Together Against Neighborhood Drilling.) This coalition of environmental justice, faith, public health, housing and community groups, including CIPL, is continuing a multi-year effort to close oil drilling sites that are in proximity to schools and residential areas. One such site is the Allenco drilling site, which has been linked to numerous health issues and which sits on land owned by the Catholic Archdiocese of Los Angeles. At the national level, there are several campaigns that continue the US’s commitment to a clean energy future but which are being opposed by the current administration. The “We’re Still In” campaign demonstrates the American people’s commitment to the Paris Agreement despite our nation now being the holdout in supporting it officially. You, as a person of faith bringing the principles of caring for the common good into the political realm, are encouraged to review, sign on, and share with others any campaigns you are involved in and any online petitions you have signed on to. Please let us know of local efforts that you are involved in that need more support.